I can just imagine myself sitting on the patio enjoying a fresh glass of lemonade while taking in the views of all my beautiful flowers. MiniFamous™ Double Lemon is a great selection for your patio containers. 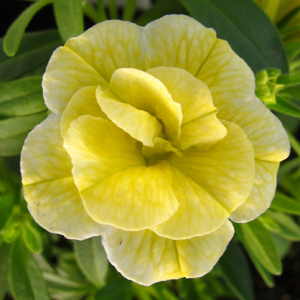 The soft yellow, double rose bud shaped flowers of Double Lemon are a very strong bloomer and can easily fill out a 10″ hanging basket. MiniFamous™ are a self cleaning variety and keep coming back for a striking impact.